The mash or wort is transferred to a fermentation vessel, usually closed in Scotland and open in the United States. These vessels may be made of wood or stainless steel. Yeast is added to begin fermentation, in which the single-celled yeast organisms convert the sugars in the mash or wort to alcohol. The yeast may be added in the form of new, never-used yeast cells (the sweet mash process) or in the form of a portion of a previous batch of fermentation (the sour mash process.) The sour mash method is more often used because it is effective at room temperature and its low pH (high acidity) promotes yeast growth and inhibits the growth of bacteria. The sweet mash method is more difficult to control, and it must be used at temperatures above 80°F (27°C) to speed up the fermentation and to avoid bacterial contamination. After three or four days, the end product of fermentation is a liquid containing about 10% alcohol known as distiller's beer in the United States or wash in Scotland. Scottish whiskey makers often distill their wash in traditional copper pot stills. The wash is heated so that most of the alcohol (which boils at 172°F [78°C]) is transformed into vapor but most of the water (which boils at 212°F [100°C]) is not. This vapor is transferred back into liquid alcohol in a water-cooled condenser and collected. Most modern distilleries use a continuous still. This consists of a tall cylindrical column filled with a series of perforated plates. Steam enters the still from the bottom, and distiller's beer enters from the top. The beer is distilled as it slowly drips through the plates, and the alcohol is condensed back into a liquid. With either method, the product of the initial distillation—known as low wine—is distilled a second time to produce a product known as high wine or new whiskey, which contains about 70% alcohol. # Light Rums, also referred to as silver rums and white rums. In general, light rum has very little flavor aside from a general sweetness, and serves accordingly as a base for cocktails. Light rums are sometimes filtered after aging to remove any color. The Brazilian Cachaça is generally this type, but some varieties are more akin to "gold rums". The majority of Light Rum comes out of Puerto Rico. Their milder flavor makes them popular for use in mixed-drinks, as opposed to drinking it straight. AGEING & BLENDING: Many countries require that rum be aged for at least one year. This aging is commonly performed in used bourbon casks, but may also be performed in stainless steel tanks or other types of wooden casks. The aging process determines the coloring of the Rum. Rum that is aged in oak casks becomes dark, whereas Rum that is aged in stainless steel tanks remains virtually colorless. Due to the tropical climate common to most rum-producing areas, rum matures at a much faster rate than is typical for Scotch or Cognac. An indication of this faster rate is the angels' share, or amount of product lost to evaporation. While products aged in France or Scotland see about 2% loss each year, rum producers may see as much as 10%. After aging, rum is normally blended to ensure a consistent flavor. Blending is the final step in the Rum making process. As part of this blending process, light rums may be filtered to remove any color gained during aging. For darker rums, caramel may be added to the rum to adjust the color of the final product. Yeast and water are added to the base ingredient to start the fermentation process. While some rum producers allow wild yeast to perform the fermentation, most use specific strains of yeast to help provide a consistent taste and predictable fermentation time. Dunder, the yeast-rich foam from previous fermentations, is the traditional yeast source in Jamaica. "The yeast employed will determine the final taste and aroma profile," says Jamaican master blender Joy Spence. Distillers that make lighter rums, such as Bacardi, prefer to use faster-working yeasts. Use of slower-working yeasts causes more esters to accumulate during fermentation, allowing for a fuller-tasting rum. The majority of the world's rum production occurs in and around the Caribbean and in several Central American and South American countries, such as Guatemala, Colombia, Venezuela, Guyana, Puerto Rico, and Brazil. There are also rum producers in places such asAustralia, Fiji, the Philippines, India, Reunion Island, Mauritius, and elsewhere around the world. Pomace brandy is produced by fermentation and distillation of the grape skins, seeds, and stems that remain after grapes have been pressed to extract their juice (which is then used to make wine). Most of the pomace brandies are neither aged, nor coloured. # Applejack is an American apple brandy, made from the distillation of hard cider. It is often freeze distilled. # Buchu brandy is South African and flavoured with extracts from Agathosma species. # Calvados is an apple brandy from the French region of Lower Normandy. It is double distilled from fermented apples. # Coconut brandy is a brandy made from the sap of coconut flowers. # Eau-de-vie is a general French term for fruit brandy (or even grape brandy that is not qualified as Armagnac or Cognac, including pomace brandy). # German Schnaps is fruit brandy produced in Germany or Austria. # Kirschwasser is a fruit brandy made from cherries. # Kukumakranka brandy is South African and flavoured with the ripe fruit of the Kukumakranka. # Palinka is a traditional Hungarian fruit brandy. It can only be made of fruits from Hungary, such as plums, apricots, peaches, elderberries, pears, apples or cherries. # Poire Williams (Williamine) is made from Bartlett pears (also known as Williams pears). # Rakia is a type of fruit brandy produced in Albania, Bosnia, Bulgaria, Croatia, Macedonia, Montenegro, and Serbia; it may be made from plums, apples, quinces, pears, apricots, cherries, mulberries, grapes, or walnuts. # Slivovice is a strong fruit brandy made from plums; by law, it must contain at least 52% ABV. It is produced in Serbia, Slovakia, the Czech Republic, and Poland. # Slivovitz is a fruit brandy made from plums. It is a traditional drink in Bulgaria, Bosnia and Herzegovina, Croatia. Macedonia, Serbia, and Slovenia. # Šlivka (pronounced: Shlyeewca) is plum fruit brandy made in Macedonia. # Šljivovica (pronounced: Shlyeewoweetza) is plum fruit brandy made in Serbia. Fruit brandies are distilled from fruits other than grapes. Apples, plums, peaches, cherries, elderberries, raspberries, blackberries, and apricots are the most commonly used fruits. Fruit brandy usually contains 40% to 45% ABV. It is usually colorless and is customarily drunk chilled or over ice. Armagnac: Armagnac is made from grapes of the Armagnac region in Southwest of France. It is single-continuous distilled in a copper still and aged in oaken casks from Gascony or Limousin. Armagnac was the first distilled spirit in France. Armagnacs have a specificity: they offer vintage qualities. Popular brands are Darroze, Baron de Sigognac, Larressingle, Delord, Laubade, Gélas and Janneau. American Brandy: American grape brandy is almost always from California. Popular brands include Christian Brothers, Coronet, E&J, Korbel, Paul Masson and J. Bavet. Brandy de Jerez: Brandy de Jerez is a brandy that originates from vineyards around Jerez de la Frontera in southern Spain. It is used in some sherries and is also available as a separate product. Grape brandy is produced by the distillation of fermented grapes. Grape brandy is best when it is drunk at room temperature from a tulip-shaped glass or a snifter. Often it is slightly warmed by holding the glass cupped in the palm or by gently heating it. However, heating it may cause the alcohol vapor to become too strong, so that the aromas are overpowered. # The first step in making fine brandies is to allow the fruit juice (typically grape) to ferment. This usually means placing the juice, or must as it is known in the distilling trade, in a large vat at 68-77°F (20-25°C) and leaving it for five days. During this period, natural yeast present in the distillery environment will ferment the sugar present in the must into alcohol and carbon dioxide. The white wine grapes used for most fine brandy usually ferment to an alcohol content of around 10%. # Fine brandies are always made in small batches using pot stills. A pot still is simply a large pot, usually made out of copper, with a bulbous top. 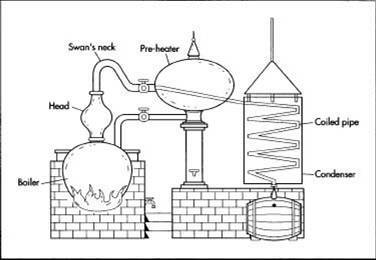 # The pot still is heated to the point where the fermented liquid reaches the boiling point of alcohol. The alcohol vapors, which contain a large amount of water vapor, rise in the still into the bulbous top. # The vapors are funneled from the pot still through a bent pipe to a condenser where the vapors are chilled, condensing the vapors back to a liquid with a much higher alcohol content. The purpose of the bulbous top and bent pipe is to allow undesirable compounds to condense and fall back into the still. Thus, these elements do not end up in the final product. # Most fine brandy makers double distill their brandy, meaning they concentrate the alcohol twice. It takes about 9 gal (34 1) of wine to make I gal (3.8 1) of brandy. After the first distillation, which takes about eight hours, 3,500 gal (13,249 1) of wine have been converted to about 1,200 gal (4,542 1) of concentrated liquid (not yet brandy) with an alcohol content of 26-32%. The French limit the second distillation (la bonne chauffe) to batches of 660 gal (2,498 1). The product of the second distillation has an alcohol content of around 72%. The higher the alcohol content the more neutral (tasteless) the brandy will be. The lower the alcohol content, the more of the underlying flavors will remain in the brandy, but there is a much greater chance that off flavors will also make their way into the final product. # The brandy is not yet ready to drink after the second distillation. It must first be placed in oak casks and allowed to age, an important step in the production process. Most brandy consumed today, even fine brandy, is less than six years old. However, some fine brandies are more than 50 years old. As the brandy ages, it absorbs flavors from the oak while its own structure softens, becoming less astringent. 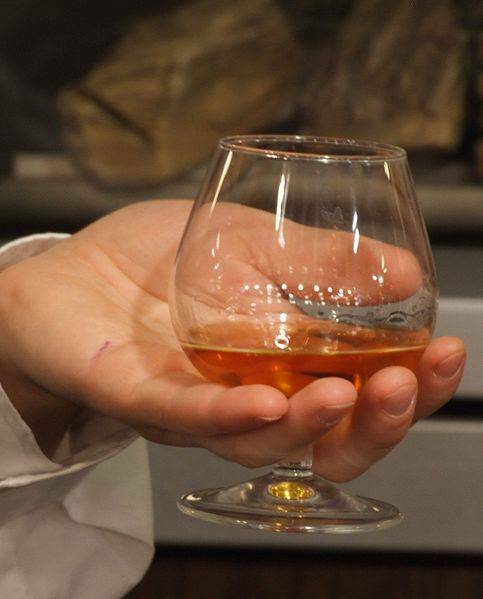 Through evaporation, brandy will lose about 1% of its alcohol per year for the first 50 years or so it is "on oak." # Fine brandy can be ready for bottling after two years, some after six years, and some not for decades. Some French cognacs are alleged to be from the time of Napoleon. However, these claims are unlikely to be true. A ploy used by the cognac makers is to continually remove 90% of the cognac from an old barrel and then refill it with younger brandy. It does not take many repetitions of this tactic to dilute any trace of the Napoleonic-age brandy. Brandy (from brandywine, derived from Dutch brandewijn—"burnt wine") is a spirit produced by distilling wine, the wine having first been produced by fermenting grapes. Brandy generally contains 36%–60% alcohol by volume and is typically taken as an after-dinner drink. While some brandies are aged in wooden casks, most are coloured with caramel coloring to imitate the effect of such aging. A column still, also called a continuous still, patent still or Coffey still, is a variety of still consisting of two columns invented in 1826 by Robert Stein, a Clackmannanshire distiller and first used at the Cameron Bridge Grain Distillery. The design was enhanced and patented in 1831 by an Irishman, Aeneas Coffey. The first column (called the analyzer) has steam rising and wash descending through several levels. 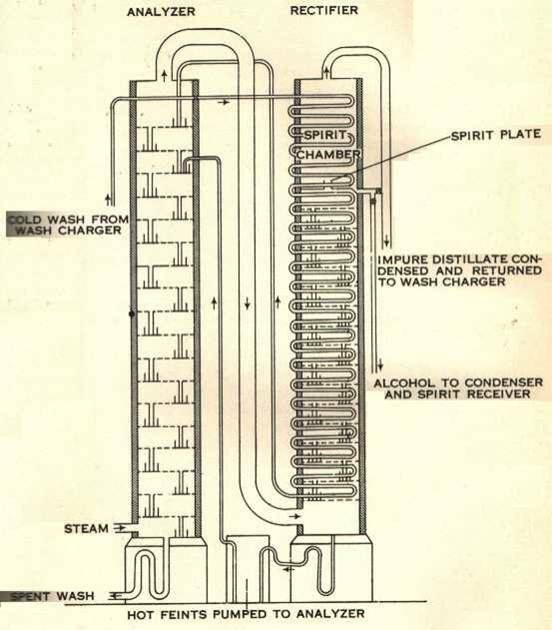 The second column (called the rectifier) carries the alcohol from the wash where it circulates until it can condense at the required strength. The English word spirit comes from the Latin spiritus, meaning "breath", but also "soul, courage, vigor“. Spirit is a high concentration potable alcoholic beverage that is obtained by the distillation of a low concentration liquid containing alcohol. The raw materials used could be wine, sugar solution or fermented grain mash. As alcohol is separated from the fermented liquid, certail other flavours remain with the alcohol known as “congeners” and give the spirit their distinct characteristics. Also ageing the spirits and the containers in which they are aged give unique characteristics to distilled spirits. There is also one important factor that one should always remember when matching wine with food - Cuisine from a particular country or region will inevitably pair best with the wines native in that country or region. This is largely due to the fact that wine and cuisine grow up together in a country. Where this is changing somewhat is in those areas where old wine making traditions are being replaced with more globally acceptable practices and styles. Generally, though, when all else fails - look to the native wines of a particular country to make the best dining partner. Claret, or more formally, red wine from Bordeaux is often tough, tannic and highly earthy and complex. These elements pair wonderfully with the gamey, robust intensity of the grilled beef. This is especially true in the case of dry aged beef and older Claret. The rich complexity of the beef blends beautifully with the subtle, unfolding complexity in the wine. If you can't find Claret, per se, then look for similarly bodied wines based on Cabernet Sauvignon, Merlot or Cabernet Franc. Like a marriage made in Heaven, foie gras finds its perfect complement in the company of the famed white dessert wine from Bordeaux. What probably makes this pair work best is the sweet, honeyed character of the wine combined with its naturally high acidity that cuts through the rich, fattiness of the duck liver. The often-gamey quality of the liver finds a welcome cushion in the nectar like quality of the wine. 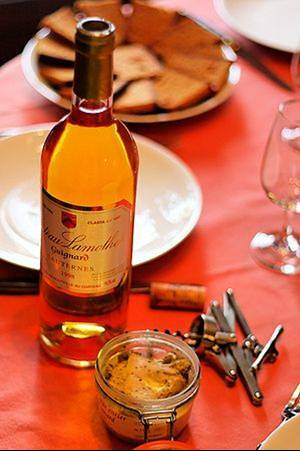 If you can't find true Sauternes, then you can often substitute a similar botrytis-affected, dessert wine. Vinegar is wine that has been acted on by a bacteria called acetobacter, which turns the alcohol in the wine into acetic acid and water. Another term for the process is called "souring". Because of this, most wines tend to taste spoiled in the presence of vinegar. Look for clean, bright, high acid wines to pair the best, whites being most favorable. Especially high acid levels in food make it tough to maintain balance. For this reason, look for high acid wines, like those made with Barbera or Vernaccia grapes to provide the greatest balance. Less acidic wines will be overpowered by highly acidic foods. The complexity and often-weedy flavors in both these vegetables make for tough wine pairing. Look for high acid, grassy wines, like Old World Sauvignon Blanc from the Loire to blend most favorably. The sulfurous quality of the egg has a similar as vinegar, imparting an unpleasant flavor to softer wines. 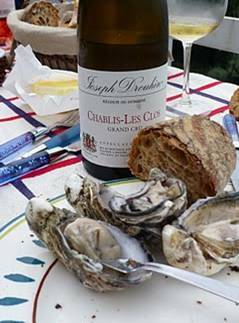 Look for clean, bright high acid wines to pair best, almost always white. The cacophony of flavors that abound in cranberry sauce and pickle relish make them near impossible to pair with wine. As with vinegar and eggs, look for clean, bright and high acid wines. The variability of chocolate in sweetness and texture can be difficult to pair well with wine. For sweeter chocolate, look for sweeter wines to make an effective pair, making sure to maintain balance in the weight and body of each. For semi-sweet or even bittersweet chocolate, look for drier wines to make an effective pair, again making sure to maintain balance in the weight and body of each. Look for compatible weights and bodies. The essence of this rule embodies the age old 'red wine with red meat, white wine with fish and white meat". In its simplest form, make sure the weight and body of the dish is consistent with the weight and body of the wine. Look for compatible acidity levels. When pairing food with wine make sure that the acidity level in both are about the same. A good example is a dish like lemon chicken paired with a high acid Vernaccia from Italy. Look for complementary flavors and complexities. Food and wine shouldn't fight one another for your attention. Instead they should help one another achieve synergy, complimenting each other's best traits. NOTE - There is a corollary to this rule that suggests looking for contradictory, but balancing flavors and complexity. If done correctly, the wine and food match will work, but this approach is much more complex and demands that the chef really knows the dish and the wine very well. Approach the corollary with caution. When matching wine to a food with a pronounced sauce, pair to the flavors in the sauce. When pairing wine with food, make sure you match according to the strongest traits of each. In a fruit glacé-type sauce one would look for a wine with forward and overt fruitiness to pair best. Without the sense of smell, neither foods nor wines have "flavor." Example: the taste and tactile sensations in an apple, a pineapple, and an onion are similar in that they are all sweet, crisp yet juicy, with some degree of acidity, but they all give a distinctly different flavor perceived through the sense of smell. By the same token, both Cabernet Sauvignon and a Petite Sirah are two types of red wine that tend to be dark, full bodied, dry, and fairly hard in tannin; but the Cabernet gives aromas and flavors of herbal, minty, berry/cassis aromas and flavors, whereas the Petite Sirah gives ripe berry/blueberry and black peppercorn-like aromas and flavors.